If you've been using email for a while either professionally or personally you have almost certainly gotten email from people you don't know. Most of these emails are blatantly unwanted while others can look 'almost' legit, as if a real person is trying to contact you. Often (and unfortunately) spammers can get your email address when you put it online or use it to register for accounts on sites on the internet. The good news is standard spam protection is getting better these days, and more advanced spam protection is cost effective for businesses that need the extra layer of protection. Spam can cause a lot of harm for a business network if it isn't kept under control - spam can bog down email servers and eat up network bandwidth and plus it drastically slows down employee productivity because they need to sift through it all just to find their real email. 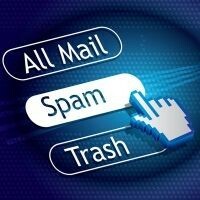 If you and your staff are getting more than a few spam emails a day, contact us at 888-755-0934 and ask about our anti-spam solutions. Be sure to keep antivirus definitions up to date, and run scans regularly. Running adware and spyware removal software at regular intervals is important too. Be sure your Windows Updates are up to date as well. For businesses, you'll want to invest in network protection to keep external threats from leaking in. Even for small Northeastern Ohio businesses, security and threat management is important to keep operations running smoothly and to prevent expensive downtime and data theft. If you send sensitive data to other recipients, you will want to consider email encryption. Some industries require this. Email encryption simply scrambles the message while it is being sent, and depending on what type of encryption, will descramble itself or allow your recipient to log in to a secure location to view the data. Although email encryption services vary, most of them are very cost effected especially when put beside the risks of sensitive data getting leaked and stolen. Give us a call at 888-755-0934 to learn more about email encryption and what solution is right for your business needs. Mega-Byte Computer Services has been serving the - area since 1995, providing IT Support such as technical helpdesk support, computer support, and consulting to small and medium-sized businesses. It's always been our goal to provide enterprise-level IT practices and solutions to the small business sector, with small business prices. Our experience has allowed us to build and develop the infrastructure needed to keep our prices affordable and our clients up and running. Wednesday, August 16 2017 Mega-Byte Computer Services launches new website! Monday, August 14 2017 How Safe is Your Email? Thursday, August 10 2017 What is your Identity Worth to You? I got such a good information on this topic its very interesting one. You made a good site and more example. I have found a similar website please check this one Security Fire Resistant Cabinet visit the site to know more about Guardall safes.